Eight-division world champion Manny Pacquiao scores a dominating victory over Adrien Broner in his first title fight after turning 40 last Dec. 17. All three judges scored a unanimous decision win for Pacquiao with two judges scoring identical 116-112 while the third judge scored it 117-111. With the convincing win, Pacquiao proves he is still competitive at 40 as he looks forward to another round with Floyd Mayweather, Jr., who expressed interest in a rematch during their brief encounter in Japan late last year. Pacquiao lost to Mayweather in 2015 via a unanimous decision. There was no knockdown in their 12-round title fight but Pacquiao caught Broner in the seventh round with power combinations that nearly brought him down as the round ended. 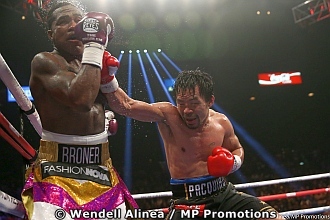 Early in the fifth round Broner was also shaken by Pacquiao’s series of power shots forcing the four-time world champ to hold in order to avoid a possible knockdown. Finding himself at the receiving end of Pacquiao’s power shots and combinations in the early rounds, Bronner seem to have slowed down and appeared to be in a survival mode in the later rounds as Pacquiao continues to pounce on him up to the last round. Despite the convincing win, Broner claimed victory before the official decision was announced. "I beat him," Broner said. "Everybody out there knows I beat him. I controlled the fight. He was missing. I hit him more times. I beat him," he added. Pacquiao has intimated that he would do 3-5 more fights before retiring. If no Mayweather fight happens this year, Pacquiao could face either Mikey Garcia or Errol Spence late this year. Garcia and Spence are set to clash on March 16 at the AT&T Arena in Arlington, Texas. The winner of the Spence-Garcia fight would likely be Pacquiao’s next foe. Aside from Spence and Garcia, two other aspiring welterweight contenders are looking forward to a lucrative fight with Pacquiao. They include Keith Thurman, who is on top of the welterweight rankings and Shawn Porter, who is a former sparring mate of Pacquaio. Pacquiao’s victory has raised his professional record to 61-7-2 while Broner dropped to 33-4-1. Click here to view a list of other articles written by Leo Reyes.